This is a rare opportunity to purchase a 17th century presbytery that has been refurbished to a very high standard. The property sits in a small hamlet with expansive views of the Normandy countryside yet it is only 5 minutes away from a main line railway station that has regular express trains to Paris, Caen and Cherbourg. The ferry port of Caen is 40 minutes away and Omaha beach is a 20 minute drive. The property dates from the 17th and 18th century and has been restored to a very high standard retaining many original features. The house sits at the end of a private lane and is extremely private with a lawned area to the rear and a walled garden to the front. Large entrance hall with downstairs cloakroom and a sweeping staircase. Dining room, which has an original "potager" as a striking feature, leads to a fully fitted kitchen and then on to a large sitting room also with an efficient wood burner. There is also a study leading off the sitting room. All of these rooms are dual aspect and provide you with a light and airy living space. Leading off from the landing area there is a large Master bedroom with en suite plus another large bedroom and family bathroom. There is a third bedroom which boasts a magnificent tiled floor which provides you with an extremely rare feature. There is an attic area on this floor which could provide you with further living space or ideal storage solutions. There are two further attic spaces which could be developed and also an attic room currently used as a craft room that could be used as a fourth bedroom. There is a large open garage with access to a mezzanine floor that again could be developed for other use plus a utility room and a "cave" to store food and drink. There is a parking area to the front of the property and a private walled garden with a pond. The rear of the house overlooks open fields and is mainly laid to lawn with several fruit trees and a herb garden with space to possibly create a vegetable garden there are also several outbuildings. As the house is south facing you will enjoy the sunshine throughout the day. 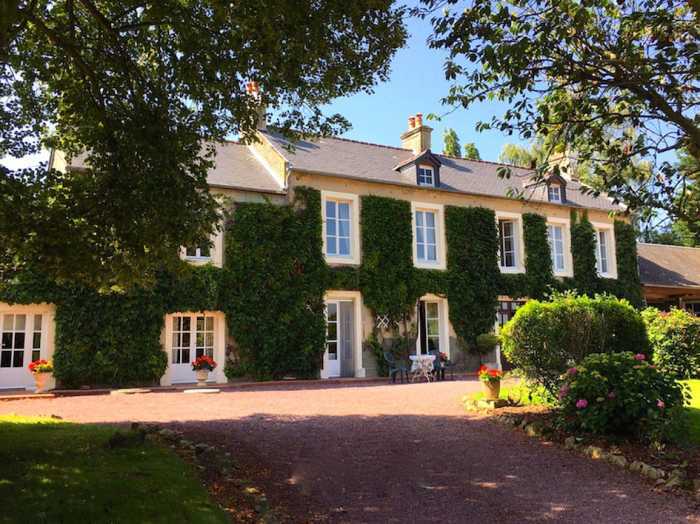 The property is only 20 minutes away from Omaha Beach and Bayeux and all of the major Normandy tourist attractions are within an hour - Le Mont St.Michel, D-Day Beaches, Swiss Normandy, Cherbourg peninsula etc. etc.